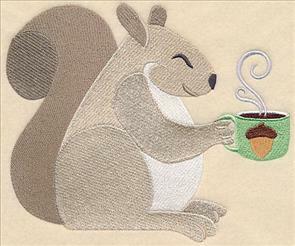 Add full-bodied flavor to your embroidery projects with new tasty coffee designs! 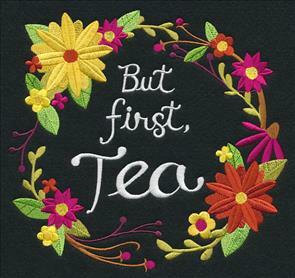 Any java (or tea!) lover will fall for the wide variety featured in this week's series. 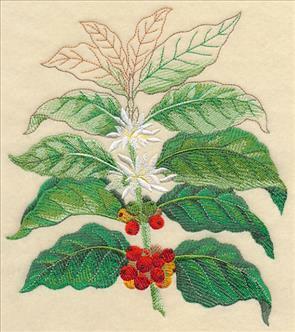 Update a pillow or tote with contemporary wreaths, or give a dish towel a whole new look with new coffee drink recipe designs. 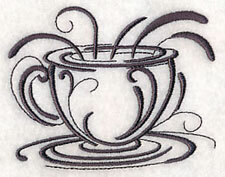 Inky coffee cups add a graceful look to table linens and quilts. 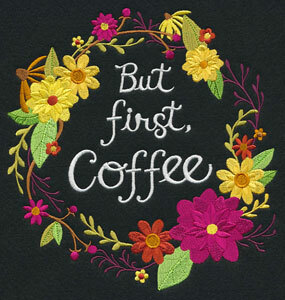 Plus, caffeinated critters, succulents in coffee mugs, botanical illustrations, and more! 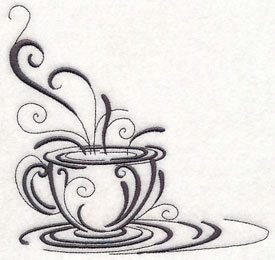 Curl up with a cup of joe, and order yours today! Display wreath designs in hand embroidery hoops to highlight their crafty shape. See how to frame with embroidery hoops here. 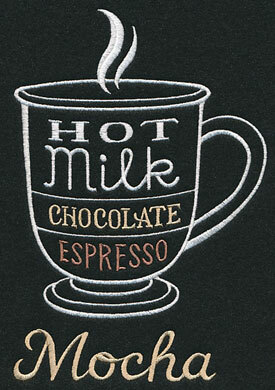 Start your morning off on the right foot with a hot cup of your favorite pick-me-up! 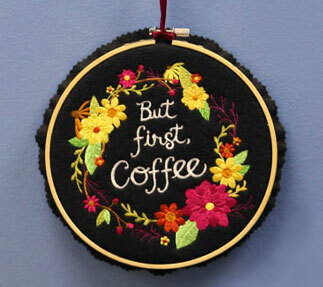 Whether you're a coffee or tea lover, you'll fall for these eye-catching wreaths. 7.48" x 7.80" and 6.77" x 7.06"
7.79" x 7.24" and 7.04" x 6.56"
6.29" x 5.85" and 5.22" x 4.86"
Order up! 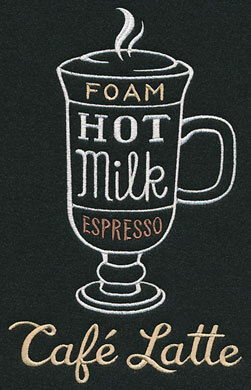 Showcase the ingredients for your favorite coffee shop beverage with these chalkboard designs. 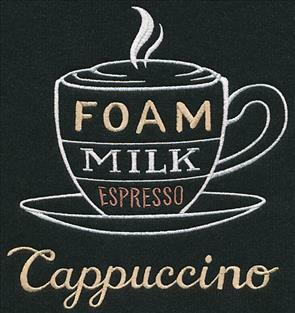 Contemporary text showcases the recipe for a latte and mocha below. 5.72" x 8.28" and 4.98" x 7.20" and 4.13" x 5.98"
These flavorful designs are perfect for tea towels! 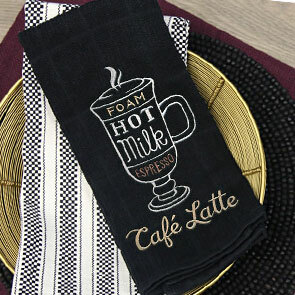 Stitch in light or white thread on a dark color towel to highlight the chalkboard style of the design, or use other colors to match your kitchen decor! For more dish towel inspiration, take a peek at our Let's Dish Lookbook! 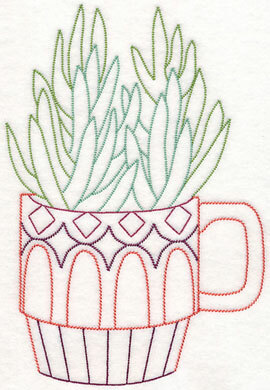 Plus, if you're new to embroidering on tea towels, the tutorial and video found here will be excellent guides. Dish towels, wall hangings, placemats, aprons, and more are the perfect way to feature these full-bodied designs. 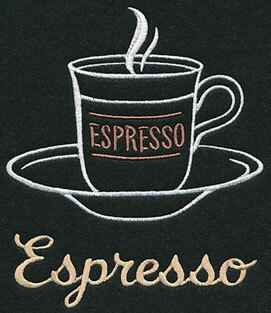 Stitch a couple of your favorites together, or embroider your signature drink on its own. 5.23" x 6.06" and 4.55" x 5.27" and 3.78" x 4.38"
Finish off this collection of cozy coffee designs with the recipe for a classic Americano. It's sure to perk up decor for your kitchen! 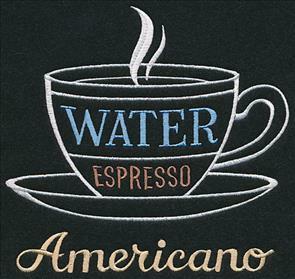 7.23" x 6.73" and 6.29" x 5.85" and 5.23" x 4.86"
Ever wonder where your favorite morning beverage begins? 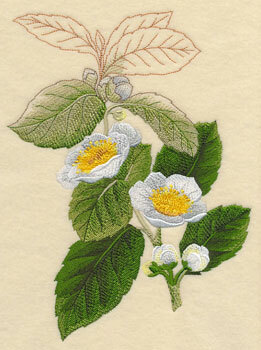 These botanical designs illustrate the beauty behind the coffee and tea plants. 6.88" x 9.21" and 5.82" x 7.81" and 4.85" x 6.50"
Succulents come in a wide variety of colors and styles, and are absolutely adorable popping out of colorful coffee mugs. 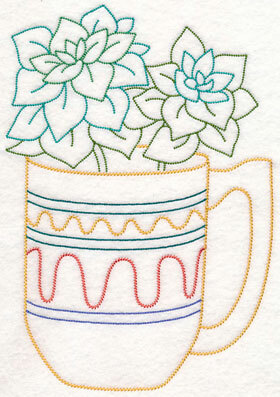 Embroider this series of light-stitching designs on a set of tea towels, or on a quilt! 6.70" x 9.59" and 5.84" x 8.34"
5.31" x 7.59" and 4.83" x 6.90"
6.77" x 9.28" and 5.89" x 8.07"
5.38" x 7.36" and 4.89" x 6.70"
Coasters are the perfect way to protect tables and surfaces from your cup of java. 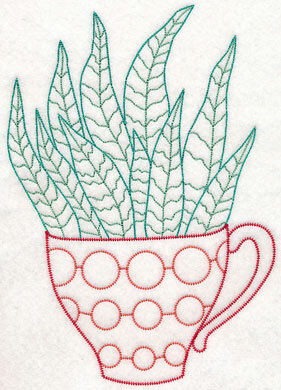 Find cloth ones and add your embroidery, or make your own! 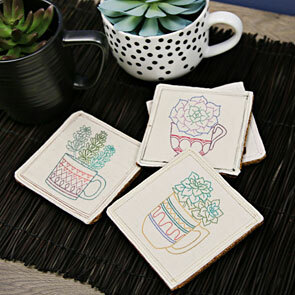 Get inspired to whip up a set of coasters with the tutorials featured on the Embroidery Library project website! 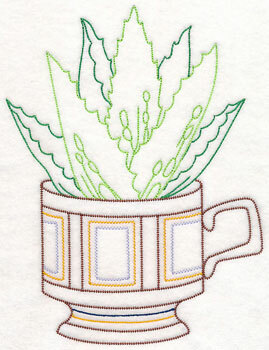 A lush aloe plant sits next to a brilliant purple succulent in these decorative designs. Perfect for the green thumb in your family! 6.77" x 9.00" and 5.89" x 7.83"
5.37" x 7.14" and 4.89" x 6.50"
6.75" x 7.83" and 5.88" x 6.81"
5.34" x 6.19" and 4.86" x 5.63"
These designs are digitized in the vintage style, and feature light stitches and open spaces. Stitch on neutral, low-nap fabrics for best results (think denim, canvas, tea towels, and linen!). 6.77" x 9.58" and 5.89" x 8.33"
5.36" x 7.58" and 4.88" x 6.90"
6.56" x 9.53" and 5.71" x 8.29"
5.19" x 7.54" and 4.73" x 6.85"
A prickly cactus rounds out this group of sweet succulents! Add all seven to a set of floursack towels (one for every day of the week! ), a series of framed artwork, and more. 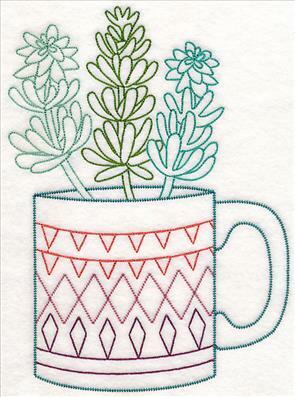 6.79" x 9.26" and 5.91" x 8.05" and 5.38" x 7.33" and 4.89" x 6.66" and 2.78" x 3.78"
Plant these succulents on your next embroidery project. Purchase them individually using the links above, or get them all in a design pack. This group of cute critters just stepped out of their local cafe with mugs filled to the brim with flavorful coffee! 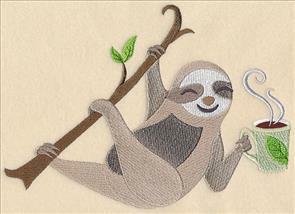 An owl and a sloth kick off the collection of eye-catching animals. 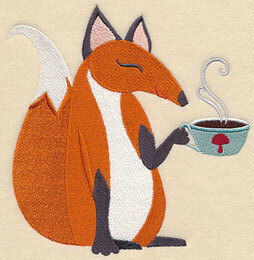 8.25" x 5.86" and 6.81" x 4.85" and 3.88" x 2.79"
A squirrel holds his hot coffee close; a clever fox does the same with his mushroom-adorned mug. 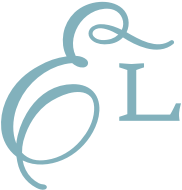 Add the contemporary critters to kitchen decor, projects for your breakfast nook, and more! 5.83" x 6.02" and 4.82" x 4.97" and 3.76" x 3.88"
Transform an old button-up shirt into a stylish apron with this trendy tutorial! It's a clever way to reuse fabric you already own, and it's too cute to boot. 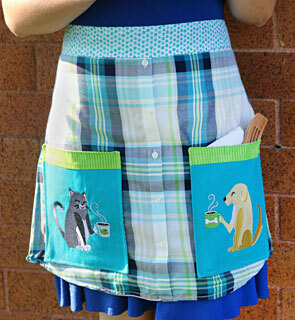 Adorable embroidery adds personal style to this fabulous apron. See the step-by-step instructions for this kitchen apron right here. 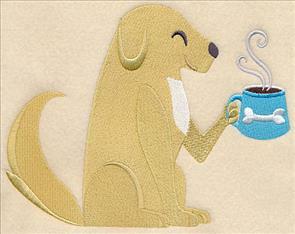 A cat and dog breathe in the delightful aroma steaming from their decorative mugs. 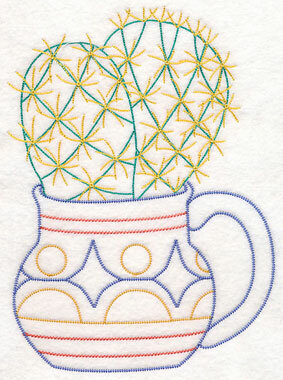 Stitch onto dish towels, quilts, wall hangings, pillows, totes, and so much more! 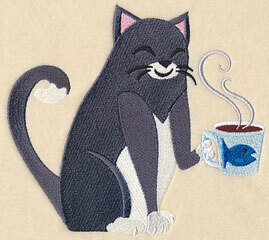 7.55" x 5.85" and 6.24" x 4.84" and 3.89" x 3.01"
These cozy critters are a great way to add full-bodied flavor to your embroidery projects. Purchase them individually using the links above, or get them all in a design pack. 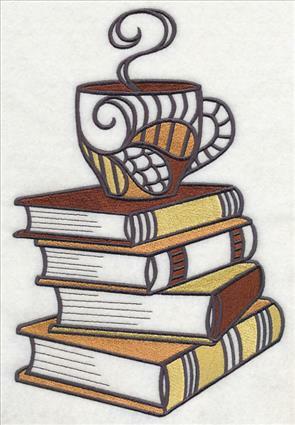 What's better than curling up with a hot cup of joe and a good read? 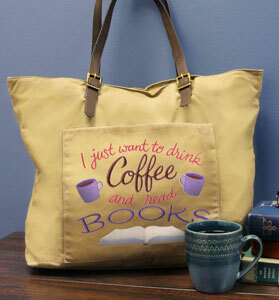 Add this fun saying to tote bags, pillows, and more to share your love for coffee and books! 8.46" x 6.86" and 7.81" x 6.33"
7.23" x 5.86" and 5.99" x 4.86"
This stylish bag is ready to head to your neighborhood coffee shop. 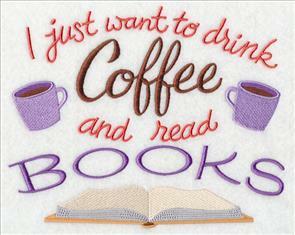 Stitch your love for coffee and books on backpacks, wall hangings, framed artwork, and dish towels, too! Two more samplers celebrate this classic combination. 6.87" x 10.02" and 5.87" x 8.55"
6.86" x 10.29" and 5.86" x 8.79"
5.21" x 7.81" and 4.58" x 6.86"
Add this inspirational quote to kitchen decor as framed artwork, on a wall hanging, or on a T-shirt. Great for gifts, too! 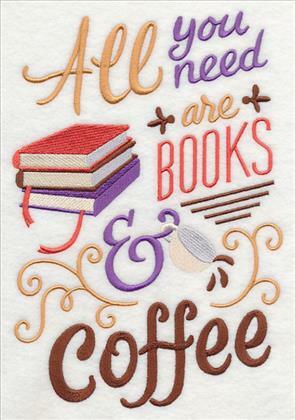 6.86" x 9.35" and 5.73" x 7.81" and 4.86" x 6.62" and 2.84" x 3.88"
Cups and mugs filled to the brim with steaming hot coffee are absolutely delightful when stitched in the contemporary Intricate Ink style. 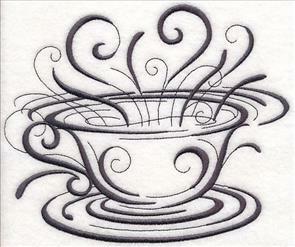 Graceful lines and filigree-inspired swirls add a delicate edge to these designs. 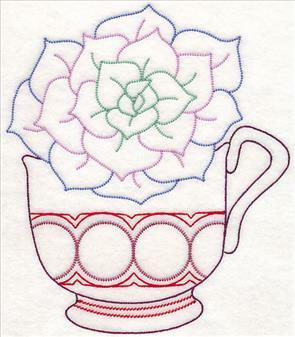 6.22" x 5.86" and 5.15" x 4.85" and 3.86" x 3.63"
Stitch this border along the bottom of a mug rug or placemat, or as a tablecloth embellishment. Perfect for your little coffee nook! 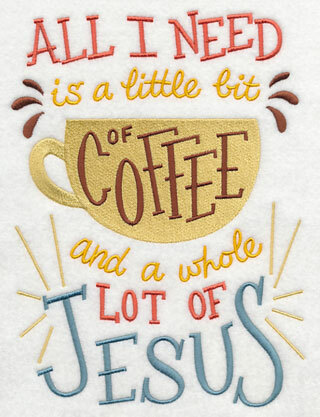 9.42" x 3.15" and 6.00" x 2.22" and 3.90" x 1.82"
A corner design and a single coffee cup are full to the brim with delicious java, and perfect for adorning napkins, pockets, coasters, and more! 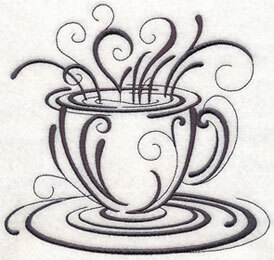 Purchase these inky coffee cups individually using the links above, or get them all in a design pack! 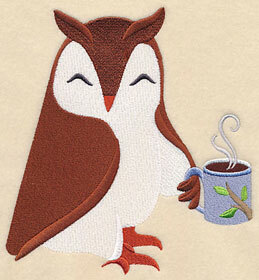 Gina liked the look of the summer and winter owl trios, and was very interested in an autumn version to add to the mix. What a great idea! It's a fabulous addition to sweatshirts and totes.